Who Won the ChristmasGifts.com Gift Wrap Organizer Contest? Home » Article of the Week » Who Won the ChristmasGifts.com Gift Wrap Organizer Contest? It’s time to announce the winner of this year’s second Christmas giveaway from ChristmasGifts.com ! One lucky person has won this handy dandy gift wrap storage bag and organizer with wheels from Miles Kimball. 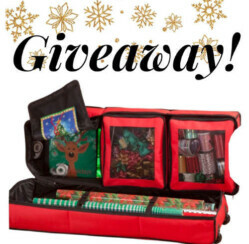 If you entered to win the giveaway, keep reading to find out who won this nifty organizer from a company that has been offering the best nostalgic Christmas gifts and decorations since 1935, and this gift wrap storage bag organizer with wheels is no exception when it comes to their high quality products. The gift wrap storage bag organizer comes with one large main compartment to store your wrapping paper, with removable compartments where you can keep your bows, ribbons, tape, scissors, name tags, and anything else you might need. Normally retailing at $45.99, it is made of durable canvas, with a handle and wheels for easy access when you need to wrap gifts, and it makes it easy to tuck away when you’re finished. So, without further ado, the winner is… Beth Palmeroni! Congratulations, Beth! We will attempt to notify you, and we hope you enjoy your free gift wrap bag, and hope you get plenty of use out of it this year. ! Merry Christmas! For all those that entered and did not win, don’t worry! Watch our social media for alerts on any other contests, and we hope you have a merry, merry Christmas! I can’t wait to get it.